Published: Dec. 27, 2017 at 12:33 p.m. Updated: Dec. 27, 2017 at 05:30 p.m.
Change is inevitable in the NFL. Bengals fans should be more than ready for the Marvin Lewis era to come to an end. I don't need advanced statistics to tell me that the 15th-year head coach and I have the same amount of playoff wins. Jim Caldwell needs to go. Lions fans deserve better. Same with the football junkies in Chicago and Indianapolis when it comes to John Fox and Chuck Pagano, respectively. Think about those four head coaches. They've worn out their welcome -- and not just in their respective cities of employ. Can you imagine any of them being head coaches elsewhere in the NFL next year? But who just needs a change of scenery? Who could use a new team to provide a jolt in 2018? Glad you/I asked. Here are nine men who could use a fresh start, guys who could still produce for new teams. In other words, Happy New Year ... now pack your bags, Schein Nine style. After Week 15's blowout loss to the Rams, it was Thomas calling out teammate Bobby Wagner. And then, following this past Sunday's big win in Dallas, it was the bizarre scene of Thomas chasing down Jason Garrett in the bowels of JerryWorld and telling the Cowboys coach to "come get me." And this was after a season-saving victory! No matter what happens this coming Sunday, Seattle needs a makeover. I love Earl Thomas. I still think the 28-year-old can play. But Thomas or Kam Chancellor has to be on the chopping block. Perhaps Richard Sherman, Jimmy Graham and Michael Bennett, too. With Thomas in particular, it's gotten out of control and spiraled rather quickly. A divorce would be best for all parties involved. I don't think it will happen, but it should. Dez is done as a No. 1 receiver. In fact, I'd argue that finding a WR1 is the No. 1 priority for the Cowboys this offseason. No. 88 hasn't turned in a single 100-yard effort in the past 22 regular-season games. He hasn't posted a 1,000-yard season since 2014. The 29-year-old's game-changing days are behind him. How about Dak Prescott's response this past Sunday, when asked about a pick that went right through Bryant's hands? "I think I have to throw him a better ball," Prescott said, via David Moore of the Dallas Morning News, before offering some (unintentionally?) damning commentary. "Just put it right there on his face mask and don't give him a chance to drop it, I guess." Ouch. But he's not wrong. Dez just isn't the transcendent wideout he used to be. The Cowboys need more firepower at the position. But would Dez be comfortable playing second fiddle in Big D? Seems like a combustible situation. Feels like it'd be best for the Cowboys to move on, and for Bryant to seek a specialized role with a new team, potentially a contender that could use a jump-ball artist in the red zone. Dez might initially shudder at the thought of a reduced role, but a true ring hunt could smooth things over, no? I like Tyrod Taylor. Always have, always will. I went bonkers when Sean McDermott inexplicably benched him for Nathan Peterman against the Chargers. Five first-half picks later, my initial intuition was validated: It was the worst coaching decision of the season. Now the Bills' interminable playoff drought might just continue courtesy of the tiebreaker the Bolts gained from that win. Ugh. Is Tyrod Taylor a superstar? No. But he's undoubtedly a legit NFL starter. In three years as the Bills' QB1, Taylor has piled up a 50:16 touchdown-to-interception ratio to go along with a 92.2 quarterback rating. That kind of production should be plenty enticing for teams like the Broncos, Jaguars, Giants and Jets, among others (depending on draft position, coaching situation or playoff result). For the most part, McDermott has done a fine job in his first year as Buffalo's head man. He's changing the culture of a franchise that hasn't seen the playoffs since the last season of last millennium. But it's a shame how McDermott has treated Taylor -- that Week 11 benching was an epic fail that unnecessarily emasculated the veteran signal caller. There's just no coming back from that. In July of 2016, fresh off a 12-sack Pro Bowl season, Wilkerson signed a five-year, $86 million megadeal with the Jets. Since then, he has essentially woken up every morning, donned a ski mask and stolen from the franchise. Mo got paid and just quit on his team. Wilkerson has missed meetings, and as a result, games. Shoot, the guy even missed out on his own birthday celebration with teammates. It's been a total mess, off the field and on it. Over the past two seasons, Wilkerson's produced a grand total of eight sacks. I'm left stunned by the whole situation. I campaigned for the Jets to lock up Wilkerson on a long-term deal for years -- and I was thrilled when they did so, writing that "Wilkerson is a do-it-all stud in the defensive front who bleeds Gang Green." Hmm. Maybe not. The results have been horrendous, and this player-team relationship is beyond repair. It's over. Wilkerson's in line to get released in the coming offseason, and he'll officially become a rehabilitation flier, a boom-or-bust player. But I'll bet a good organization -- like Baltimore or New England -- banks on Wilkerson getting his career back together. The clock started ticking on this inevitable breakup last April, when the Chiefs traded up to pluck Patrick Mahomes with the No. 10 overall pick. Credit Smith for handling the situation like a true pro. And credit Smith, head coach Andy Reid and offensive coordinator Matt Nagy for stopping Kansas City's midseason bleeding (six losses in seven games) and running off three straight wins to take the AFC West. But this team won't make a Super Bowl run. And 2018 will mark the beginning of the Mahomes era in K.C. I remain a big fan of Smith. The 33-year-old can still play and lead. He won't have trouble finding a new home in 2018. 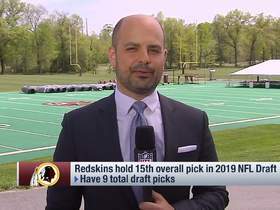 How about Washington D.C., if/when the Redskins screw it up with Kirk Cousins? Buffalo? Jacksonville? Smith should have a number of suitors. The person who deserves the most blame for Green Bay missing the playoffs is Ted Thompson. The general manager has squandered much of Aaron Rodgers' prime by not surrounding him with the requisite talent of a true title contender. But Capers' defense -- albeit talent-deprived, again thanks to Thompson -- has been dreadful again in 2017. The Packers currently rank 21st in scoring defense and 22nd in total D. Those are the exact same rankings this lackluster unit posted last season. I think Capers is a very good coach and very good person, but a change is needed in Green Bay. Now, this is sure to be an active coaching carousel, with a number of teams in line for changes at the top. And when a new, young head coach is putting together a staff, hiring someone with Capers' immense experience would be a plus. The 26-year-old has talent, and plenty of it. What he lacks is focus and discipline, especially off the field. And now, in Pittsburgh, he's essentially been replaced by rookie JuJu Smith-Schuster. But would he be a worthy trade target for another team? Of course. Bryant has scored 18 touchdowns in 35 career games. The guy has the size (6-foot-4, 211 pounds), speed and skill to torch NFL defenses when his mind's right. I blasted the Giants when they spent the No. 10 overall pick on Apple back in April of 2016. He sure didn't seem like the 10th-best player in that class to me. That said, the 22-year-old has the kind of size (6-1, 201 pounds) that many covet in the cornerback position. And it appears that the New Jersey native is sadly dealing with family issues, which could help explain his erratic behavior over the past year. So a relocation away from the Giants -- and the area -- could serve him quite well. I love the 29-year-old back and his hard-charging running style. But for the Titans, it could be time to give the keys to Derrick Henry. He's fresher. He's younger. And right now, he's better. The Titans should make Henry their bell-cow back in 2018. Murray can still play, but I think he'd be best in a specialized role elsewhere.